To our knowledge, this is the first report of an ABO-incompatible living-donor renal transplant without a splenectomy performed in a patient with renal coloboma syndrome, a rare disorder caused by PAX2 gene mutations, and that presents with renal and optic nerve hypodysplasia and disorders of the central nervous system. Many patients with renal coloboma syndrome develop end-stage renal disease requiring renal replacement therapy. Few reports of a well-defined course of renal transplant for coloboma syndrome have been published. We treated a 22-year-old man who had end-stage renal disease from renal coloboma syndrome. We performed an ABO-incompatible living-donor renal transplant with a kidney donated by his father. Two years after the transplant, the patient has good preserved renal function, and his compliance with the immunosuppressive regimen was good. Renal coloboma syndrome is a rare disorder caused by PAX2 gene mutations. Patients with a homozygous mutation of PAX2 die soon after birth owing to the lack of organogenesis including that of the kidneys, eyes, ears, and midbrain.1 By contrast, patients with a heterozygous mutation of PAX2 may survive despite the usual presence of hypodysplasia of the kidneys and optic nerves. Such patients may have additional congenital anomalies including vesicoureteral reflux, loss of high-frequency hearing, and central nervous system.2 Patients with a heterozygous PAX2 mutation ultimately develop end-stage renal disease requiring dialysis or transplant.3 Some patients with renal coloboma syndrome have to undergo a renal transplant,3,4 but there are no reported cases of an ABO-incompatible living-donor renal transplant. To our knowledge, this is the first report of an ABO-incompatible living-donor renal transplant without splenectomy performed in a patient with renal coloboma syndrome. A 22-year-old man presented to our hospital’s urology out-patient department with end-stage renal failure. Proteinuria was observed in him at age 7, during an annual mass screening program for school children, and he received periodic follow-up at a local clinic. He had developed mild renal dysfunction (creatinine clearance, 60.2 mL/min/1.73 m2) by the age of 9, computed tomography showed bilateral renal hypodysplasia. At 18 years, ophthalmoscopic examination revealed hypoplastic optic disks and retinal detachment in the left eye. Vesicoureteral reflux was not detected by voiding cystourethrography. Visual acuity was 0.1 (right eye) and 0.3 (left eye). He has had mild mental retardation since infancy, and his WISC-III test score was 70 at age 19. There was no past history of seizure. Computed tomography imaging showed no apparent brain atrophy or demyelination. Gene testing and PAX2 analysis revealed a novel heterozygous mutation in exon 3 (P130H). This PAX2 gene mutation resulted in a phenotype of renal hypodysplasia and optic nerve dysplasia. There is no family history of urinary abnormality, renal failure, or severe vision disorder. He became uremic (blood urea nitrogen, 37.49 mmol/L; serum creatinine, 707.2 μmol/L) at age 19 requiring dialysis. At his initial visit to our outpatient department, the patient expressed his hope for a living-donor renal transplant with a kidney, donated by his father. His ABO blood type was O Rh(+) and his father’s was B Rh(+). Direct crossmatch test was negative, and human leukocyte antigen mismatch was 2/6 (human leukocyte antigen-A, B, DR). Neither he nor his father had any infectious diseases. The patient’s height and body weight were 163 cm and 64 kg on admission. We planned an ABO-incompatible living-donor renal transplant. The clinical course timeline is shown in Figure 1. The pretransplant regimen was begun 3 weeks before the renal transplant with mycophenolate mofetil 2 g/d, and tacrolimus 10 mg was administered daily beginning 2 weeks before the renal transplant. We educated him on using a drug administration table for his immunosuppression medication. Anti-CD20 monoclonal antibody rituximab 100 mg was given at 14 days and 1 day before renal transplant, in lieu of splenectomy. We performed a double-filtration plasmapheresis and a plasma exchange before the renal transplant. After the plasma exchange, his anti-B antibody titer decreased to 1:2. Renal transplant and 1-hour biopsy of the renal graft were performed routinely. Biopsy findings showed average renal tissue. Rebound of anti-B antibody titers was slight (highest titer was 16:1 on postoperative day 5). After the renal transplant, our patient had a seizure on the operative day that was refractory to conservative therapy. He was afebrile with his blood pressure being 116/61 mm Hg, but there were no signs of neurologic deficit except the seizure. His tacrolimus level was 14.2 ng/mL at this point, and there were no electrolyte abnormalities. We performed brain computed tomography scan and magnetic resonance imaging—neither of which revealed anything noteworthy. Therefore, we changed the calcineurin inhibitor from tacrolimus to cyclosporine on postoperative day 3 because of the possibility of drug-induced encephalopathy. After that he had no seizures and we continued to administer cyclosporine. Cerebrospinal fluid analysis was not done because of prompt improvement of the symptom after we stopped tacrolimus. The protocol biopsy performed 2 weeks postoperatively revealed a pathological finding of borderline changes according to the 2007 Banff classification. His postoperative course was uneventful, except for the seizure, and he was discharged to home on the 25th postoperative day with good renal function and a serum creatinine level of 99.89 μmol/L. At discharge, he could take his medication accurately. Two years after the renal transplant, he had no proteinuria, and his serum creatinine was 106.96 μmol/L. His compliance with the immunosuppressive regimen was good despite, his mental retardation and poor eyesight. Renal coloboma syndrome is a recently characterized hereditary syndrome with autosomal dominant inheritance. The association of PAX2 gene mutation with this syndrome was first identified in 1995.5 From 1995 to 2001, only 32 cases describing the analysis of PAX2 and characteristics of its clinical manifestations have been reported.6 PAX2 affects the development of the eyes, ears, central nervous, and genitourinary systems during fetal development.1 Many patients with a mutation in PAX2 will ultimately develop end-stage renal disease requiring dialysis and transplant. Some patients with renal coloboma syndrome have undergone a renal transplant,3,4 but to our knowledge, there had been no reported cases of an ABO-incompatible living-donor renal transplant. Our patient’s other family members had no history of end-stage renal disease or severely impaired vision. We consider this to be a sporadic case, but the mode of inheritance of his PAX2 gene disorder is unclear, because informed consent for gene analysis of his parents could not be obtained. 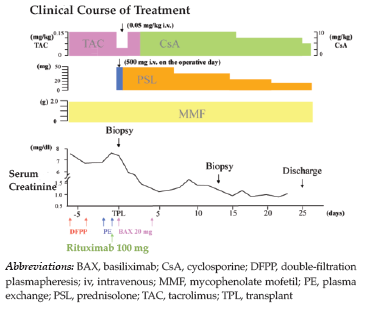 Mitsuhata and associates reported that plasma exchange decreases the therapeutic effect of rituximab when administered for treatment of humoral rejection.7 We therefore administered rituximab twice, at 14 days and 1 day, before the renal transplant. Progressive multifocal leukoencephalopathy is a rare, and is often a fatal dysmyelinating disease of the central nervous system. One important cause of progressive multifocal leukoencephalopathies immunosuppressive drug therapy, such as rituximab.8 Although the pathogenesis and exact mechanism of action of particular drugs leading to progressive multifocal leukoencephalopathy are not completely understood, the association between progressive multifocal leukoencephalopathy and rituximab are well established.9 We could not prevent our patient from developing progressive multifocal leukoencep­halopathy from the use of rituximab, because he might have had a dysmyelinating disorder. Fortunately, there were no signs of progressive multifocal leukoencephalopathy during the clinical course and our concern proved unfounded. On the operative day, our patient had a seizure that was refractory to conservative therapy. We considered calcineurin inhibitor-associated encephalopathy as a possible cause because tacrolimus shows neurotoxicity even at the therapeutic trough level.10 Calcineurin inhibitor-associated encephalopathy is characterized by subacute onset of seizure (74%), altered mental status (50%), hypertension (37%), visual abnormalities (28%), and fever (10%).11 Elevated drug levels are reported in 61% of patients, but not in all reports. Cerebrospinal fluid findings are characteristically unremarkable, but may demonstrate an elevated protein in one-fourth of all cases.11 The most common site of neuroimaging abnormalities on computed tomography or magnetic resonance imaging are the occipital, parietal, and temporal lobes. Calcineurin inhibitor-associated encephalopathy is generally reversible on removal or reduction in dosage of the CNI. Clinical symptoms can improve within days after removing or reducing the drug.11 After we changed the calcineurin inhibitor from tacrolimus to cyclosporine, the clinical symptoms in our patient improved appreciably. There was no sign of significant encephalopathy on neuroimaging, but the clinical course in this patient might have been consistent with calcineurin inhibitor-associated encephalopathy. We had to plan posttransplant immunosuppressive therapy carefully, because the patient could not possibly self-administer his medication because of his mental retardation and poor eye sight. Use of a drug administration table was effective for self administering his immunosuppression medication. This case highlights the possibility of performing ABO-incompatible living-donor renal transplant without splenectomy in patients with renal coloboma syndrome. Although extreme caution is required, patients with renal coloboma syndrome might be candidates for ABO-incompatible living-donor renal transplant without splenectomy. Torres M, Gómez-Pardo E, Dressler GR, Gruss P. Pax-2 controls multiple steps of urogenital development. Development. 1995;121(12):4057-4065. Eccles MR, Schimmenti LA. Renal-coloboma syndrome: a multi-system developmental disorder caused by PAX2 mutations. Clin Genet. 1999;56(1):1-9. Porteous S, Torban E, Cho NP, et al. Primary renal hypoplasia in humans and mice with PAX2 mutations: evidence of increased apoptosis in fetal kidneys of Pax2(1Neu) +/- mutant mice. Hum Mol Genet. 2000;9(1):1-11. Schimmenti LA, Shim HH, Wirtschafter JD, et al. Homonucleotide expansion and contraction mutations of PAX2 and inclusion of Chiari 1 malformation as part of renal-coloboma syndrome. Hum Mutat. 1999;14(5):369-376. Sanyanusin P, Schimmenti LA, McNoe LA, et al. Mutation of the PAX2 gene in a family with optic nerve colobomas, renal anomalies and vesicoureteral reflux. Nat Genet. 1995;9(4):358-364. Erratum in: Nat Genet. 1996;13(1):129. Salomon R, Tellier AL, Attie-Bitach T, et al. PAX2 mutations in oligomeganephronia. Kidney Int. 2001;59(2):457-462. Mitsuhata N, Fujita R, Ito S, Mannami M, Kojima K. Is administration of rituximab at 375 mg/m without splenectomy appropriate for ABO-incompatible renal transplant? Am J Transplant. 2005;5(12):3019; author reply 3020. Schmedt N, Andersohn F, Garbe E. Signals of progressive multifocal leukoencephalopathy for immunosuppressants: a disproportionality analysis of spontaneous reports within the US Adverse Event Reporting System (AERS). Pharmacoepidemiol Drug Saf. 2012;21(11):1216-1220. doi: 10.1002/pds.3320. Berger JR. Progressive multifocal leukoencephalopathy and newer biological agents. Drug Saf. 2010;33(11):969-983. doi: 10.2165/11537510-000000000-00000. Eidelman BH, Abu-Elmagd K, Wilson J, et al. Neurologic complications of FK 506. Transplant Proc. 1991;23(6):3175-3178. Singh N, Bonham A, Fukui M. Immunosuppressive-associated leukoencephalopathy in organ transplant recipients. Transplantation. 2000;69(4):467-472. Acknowledgements: No author received any support in relation to the case reported herein, and no author has any conflicts of interest.